Lilah’s Quick Arrival Mama Say What?! | Mama Say What?! January 23, 2011 was a day I will never forget. It was officially the LONGEST I had ever been pregnant. 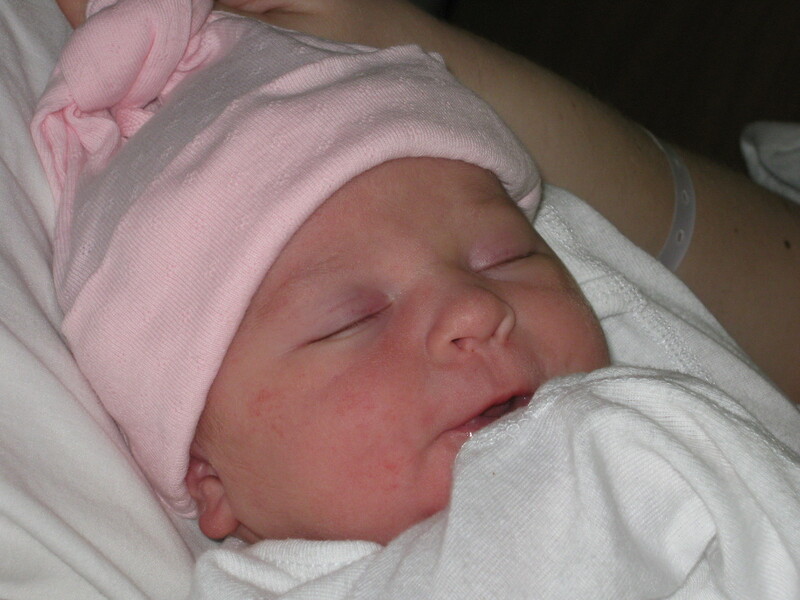 I was 39 weeks pregnant that day, and although I’m sure a few of you readers are snickering at me, I had my first baby at 38 weeks, so I had been positive that Lilah would be an early arrival as well. I was just done being pregnant. The insomnia had kicked in big time, I was in pain, and I just wanted to meet my little girl. When I realized that I was still pregnant at 39 weeks, I was afraid that I was going to be pregnant forever and I started bawling. I cried so hard that my poor four-year-old thought something was wrong and ran to the garage to get my husband. He tried to console me but I don’t think that there was anything he could say to make me feel better. I had an OB appointment that day and I was hoping to hear that I had progressed. Of course the first thing they do is put you on the scale. I gained almost double what I had with Ryleigh, so that just darkened my mood even more. When my doctor came in to see me, he could tell right away that I was not myself. I could not bring my normal chipper self to even crack a smile. He must have had pity on me because during the check he told me that he was going to swipe my membranes. He told me that the baby was very low, and although I was just three centimeters, he predicted that I would have a baby in my arms in the next 24 hours. I left the doctor’s office feeling a little more positive. I knew this could be it. My husband, Craig, made me some delicious homemade chili (yep, the spicy kind) for dinner. I literally danced around the house like a crazy person while mopping the floors. Finally around 11:15 p.m. I decided I better hit the hay. I laid down and started feeling crampy. Then I felt contractions. I didn’t time them because with my first they were had never been regular, even when I was full dilated and ready to push. I tried to force myself to sleep until about 1 a.m. when I just gave up because I was too excited and crampy to sleep anyhow. Ideally I would have liked to wait longer before we left, but I had to wait until my mother-in-law and sister-in-law showed up. They lived a half hour away, and there was an ice storm that night. It took about an hour for my sister-in-law and my mother-in-law to arrive. Ryleigh went with my sister-in-law, and my mother-in-law went with us to the hospital. After a nerve-wracking ride there (we only lived ten minutes away, but it still took us about 25 minutes to get there) I told Craig just to park himself and I would walk in. Once we were in triage, the nurse checked me. I had only progressed half a centimeter since my doctor appointment earlier that day and I was sure that she was going to send me home. With the weather being so terrible outside, I was determined NOT to be sent home. The nurse gave me permission to walk for a half hour and see if I progressed. My husband and mother-in-law sat at the end of the hallway as I walked and walked. I jumped, skipped and hopped down the hallway too. After 30 minutes of walking, the triage nurse checked me again and we had progress! I was a full four centimeters and 100% effaced. When she told me that I would be admitted I was thrilled. The rest of the early morning hours were pretty boring. I got an epidural and slept a bit. I felt like I was either texting or calling someone all morning once 7 a.m. rolled around. We were all in great spirits, and my epidural was working wonderfully, so I had no pain. At 8:15 a.m. the labor and delivery nurse came in and discussed adding Pitocin. I agreed, even though I said I would never accept Pitocin. She said that she expected to meet our new baby by noon. We all started making bets on when Lilah would make her appearance. My mother showed up around 10 a.m. and things were beginning to get really intense for me. I didn’t want a lot of noise, and insisted on my husband’s hand. I started feeling really off and the room started spinning. I asked Craig how Charlie (our cat) had made it into the delivery room. He thought I was getting delusional from the pain and decided to call the nurse in. The nurse came in a checked me and I was a full 10 centimeters and ready to push. She called the OB and did test pushes with me. After two pushes she told me to stop and wait for the doctor to arrive. He came in with mustard still on his face from his lunch (that he had been in the middle of eating) which we all thought was pretty funny. Lilah came out with three more contractions. She had the cord wrapped around her neck a couple of times which they quickly took care of. Her first cries were music to my ears. Craig, his mother and I all broke down into tears. It was one of the most beautiful moments of my life. Added by Miriam R. on September 2, 2012. Pingback: Unexpected Surprise: My BFP?! Mama Say What?! | Mama Say What? !